An irresistibly gifty kitchen resource from one of the world's top culinary authorities, illustrated throughout in full color. In this savvy little kitchen companion, Anne Willan - founder of the famed French cooking school La Varenne and winner of the prestigious IACP Lifetime Achievement Award - has collected more than 200 of her best solutions for everyday cooking crises. 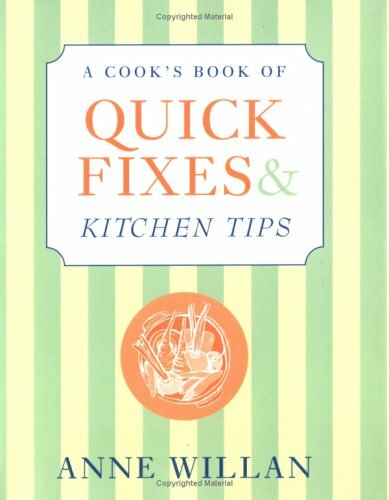 With Willan's succinct advice and simple recipes, home cooks can easily transform would-be kitchen disasters into new opportunities for culinary creativity. Overcooked root vegetables get transformed into a tasty purée; dry baked chicken gets a revitalizing sesame-ginger glaze; and runny chocolate mousse becomes the perfect ice cream topping. Featuring 150 charming color illustrations and tips on all types of culinary mishaps - from meat and poultry predicaments to dessert and baking dilemmas - this winning little book will save the day in any kitchen. Anne Willan directs her La Varenne cooking school in Burgundy, France, and at the Greenbriar Resort in West Virginia. She is the winner of three James Beard Awards and an IACP award for her cookbooks, which include Anne Willan: From My Chateau Kitchen, the classic La Varenne Practique, and, most recently, The Good Cook.